The tool allow you to get more info about the processes like the IDs of all the threads, handles to DLLs, ability to suspend specific threads of a specific process and, finally, an ability to view the process virtual memory. Cisco has updated its security reference architecture guide, known as SAFE. The Cisco SAFE consists of design blueprints based on proven security best practices that provide the design guidelines for building secure and reliable network infrastructures. - An infected machine within some botnets are capable of sending 25,000 SPAM message per hour. - Almost 75% of overall spam messages are coming from only 4 botnets. - The largest source of spam is Rustock botnet, and it is active for more than 2 years. 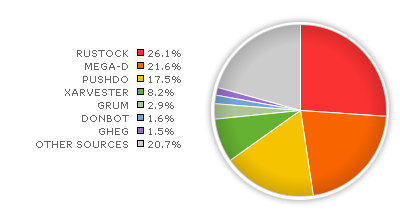 - The research is looking at the big 10 SPAM botnets (Rustock, MEGA-D, Pushdo, XARVESTER, GRUM, Donbot, Gheg, Bobax, Srizbi, Waledac) with more details here. New freely available tools demonstrated in Blackhat last week showed that MPLS, BGP, and Metro Ethernet are vulnerable to several attacks. The MPLS used to segregate network traffic for corporate customers, can be modified by an attacker to gain access to other MPLS networks. As the MPLS has no mechanism for protecting the integrity of the headers that determine where a data packet should be delivered, the tool was used to modify the header. although the attack is difficult to be carried out as it require the attacker to be in the MPLS backbone. An Italian researcher "Bernardo Damele Assumpcao Guimaraes" presented in Blackhat Amsterdam last week some new techniques that could allow for full control on a target system. One of these techniques is using patched queries to read or write a malicious file on the file system, the attack assumes that the user has specific privileges depends on the attack type. The attack details are different from one DB to another, and may require other workarounds to avoid restrictions in some DBs. The presenter is one of the developer of sqlmap tool which can be used to automate these techniques. The tool will fingerprint the DB and continue the attack accordingly. - Export the hex encoded contents from the table into destination file path using SELECT's INTO DUMPFILE clause. - Retrieve the length of the written file "LENGTH" to check if it was written correctly. Italian Security researchers presented a nice demo on how they managed to hijack mobile data connection, simply by sending a fake binary configuration message to a mobile phone pretending to be sent from the carrier, if the recipient accepted the message (which is normally accepted by anyone) a new access point will be created on the mobile with a malicious DNS server IP and maybe also an http proxy IP. This will allow the attackers to monitor all data connections from this mobile. - Usage of external DNS service from withing the mobile network, if enabled. - Also http proxy parameter pointing to external address. - Proper filtering of OMA provisioning messages. Blocking access to external DNS servers from mobile devices, however this could lead to DOS attack, if the attacker managed to change the DNS settings of a mobile phone, that mobile will have no access to the internet. This is a free, quick, and standalone exploit framework for windows. Exploits are updated almost daily. I am a big fan of syslog-ng, and personally used it to handle 5 million syslog messages per day with mysql on a single server. You can also use a web front-end with it http://www.phplogcon.org/ , also http:// code.google.com/p/php-syslog-ng/ can be used. A new paper about mining search engines for facebook data shows that user's ignorance and poorly designed privacy control can reveal lots of information about the users. This information can be use by marketers to target a small set of users with high influence to reach the entire network. And if an attacker can compromise a small dominating set, he can reach out to the whole network. They have found that compromising 10% of the users, can lead to compromise more than 50% of messages in that network. The Honeynet Project has an article about detecting Conficker infection with a link to a tool to scan you network for possible infection. Didier Stevens released PDFiD tool to help in identifying if a pdf file could be malicious or most likely not , the tools is based on string scanner.